For me in Japan, that dish was okonomiyaki. I traveled to Japan for the first time in 2010 with my friends Karen and Crispin. We flew into Osaka from Cairns and arrived late in the night. After a long flight, we were tired and hungry, but somehow managed to navigate our way through the spider web of train and subway lines to get the right one to our guesthouse. Then all we wanted to do was eat some food. For a momentary lapse, I was in a state of panic, as it was late and I thought that there would be nothing open and we’d be eating meat pies that had been in the warmer for a questionable number of hours from a petrol station. But right away I was reminded that we were in Japan, not Perth, and Japan is a 24/7 economy. There was a 24 hour supermarket nearby, a 7-Eleven on every street corner and a vending machine everywhere I looked. I was never going to starve here, no matter what time of day. We asked our guesthouse where we could eat nearby and a late night okonomiyaki place was recommended to us. Okonomyaki is a savoury pancake and a dish that Osaka is famous for. I had never eaten it before. I didn’t even know such a thing existed. In Australia, Japanese is famous for teriyaki everything, which I would later find out isn’t an actual Japanese dish but a way of cooking, where ‘teri’ refers to the shine on the meat from a glaze given by the ‘yaki’ which means grilling or broiling. In Australia, teriyaki has been appropriated as a dish consisting of a sweet soy sauce that is slapped on top of meats and often drowns it. Teriyaki is a cooking technique, not a sauce! You will not be about to order a teriyaki chicken in Japan, it doesn’t exist, well not in the form that would be familiar to people from Western countries. It’s always eye-opening to visit a country and realize that this is what you should be eating and to learn how cuisines have been adapted (or bastardised) overseas. I remember eating okonomiyaki for the first time and thinking that it was the most delicious thing I had ever eaten, all my senses were awakened and I no longer felt tired. It’s that feeling that you get when you are drunk and/or hungover and eating a kebab at 2am in the morning, and it feels like you are having the best meal ever, except I was totally sober. Maybe it was a case of me being so hungry that anything which hit my taste buds would have received A+ but on the other occasions I ate okonomiyaki, it still had the same affect. It's a damn good pancake. As my first meal in Japan, okonomiyaki set the bar pretty high and was an indication of the general awesomeness that I would continually experience during my trip in Japan. It confirmed for me why Japan is so highly regarded for their food and consistently features as one of the top food travel destinations. Okonomiyaki is made up of a batter consisting of flour, grated yam, water or dashi, eggs and shredded cabbage, and you can add in any other ingredients you want such as meat (pork or beef), various seafoods (like octopus, squid, shrimp) and vegetables. The name is derived from the word okonomi, meaning "what you like" or "what you want", and yaki meaning "grilled" or "cooked". So okonomiyaki literally means “grilled as you like it” and this makes sense there are many different things you can put into it. The batter is fried on both sides and the cooked okonomiyaki is topped with Japanese mayonnaise, an otafuku/okonomiyaki sauce (similar to Worcestershire sauce but thicker and sweeter), katsuobushi (bonito flakes), aonori (seaweed flakes) and pickled ginger (beni shoga). I have always wanted to try making okonomiyaki at home. Looking through recipes on the internet I found that many made the pancake batter by mixing flour with some water or dashi stock and then gave some comment that it’s similar but not quite there, it’s good enough, or it’s some healthier version. Nagaimo (a Japanese starchy yam) is required for texture, to give it a glutinous/gelatinous quality, but most omitted this. I have not being convinced enough by the recipes I have seen to try it. I wanted to be able to recreate the closest possible version of okonomiyaki that I had in Japan as I could. One day I saw okonomiyaki kits for sale at an Asian supermarket that I frequent, it contained all the required ingredients – special okonomiyaki flour, tenkasu and seasonings. All I had to do was add egg, vegetables and meat. I was curious to try it to see what it would be like, even though it was a packet mix. So I made okonomiyaki from a packet and it was delicious, it was better than I thought it would be, it was so good that it brought back memories of the first time that I ate okonomiyaki in Japan. I read the packet to see what was contained in the mix and I found monosodium glumamate (aka MSG) listed in the ingredients. It all made sense now, no wonder it tasted so good. It's like the kicker that sweetens the deal. Growing up in an Asian family, MSG is considered just another seasoning amongst many, but it is generally viewed negatively and is forever linked with Chinese Restaurant Syndrome even though there is no evidence that it exists. MSG is a flavour enhancer, much like salt or sugar. Maybe this is where its death sentence lies because MSG is not some magical powder that will make your cooking taste good. Its problem isn’t that it’s used, but that it’s overused and without much thought. Salt and sugar are also victims of been excessively used to make foods taste good, with some known side effects, where overly salty foods can make you thirsty and too much sugar gives you a sugar high. I generally don't use MSG because I cook with a lot of amino acid rich foods which contain glutamates and are naturally rich in umami. I don’t have a problem with MSG but strive to work with natural ingredients as much as possible. The key to cooking is being judicious in the use of ingredients and achieving balance, so when natural glutamates are used, it is unnecessary to add any additional forms like MSG as more won’t make a difference or can lead to a decline in flavour. The interesting thing that I found out which many people might not be aware of it is that what constitutes MSG occurs naturally in many foods that people eat all the time. Glutamate causes the taste sensation umami and the glutamate in MSG confers the same taste of glutamate found in other foods, so 'natural' and 'industrially produced' glutamate are chemically the same, and treated by the body similarly. The body does not distinguish between the naturally occurring glutamate in tomatoes, cheese or mushrooms and the glutamate from MSG added to foods. I will definitely be making okonomiyaki using a packet mix again. I was really happy with the result and sometimes it’s just nice to have something that is handy and convenient to cook up. Maybe it’s the hit of MSG sealing the deal for me, but some things should be enjoyed as it is, without too much though. Sometimes the things that might just be a little bit bad for you are what you deserve…like a packet of Mi Goreng every now and then because you know why you ate it religiously during the times you were a poor arsed uni student and it wasn’t because it was cheap. 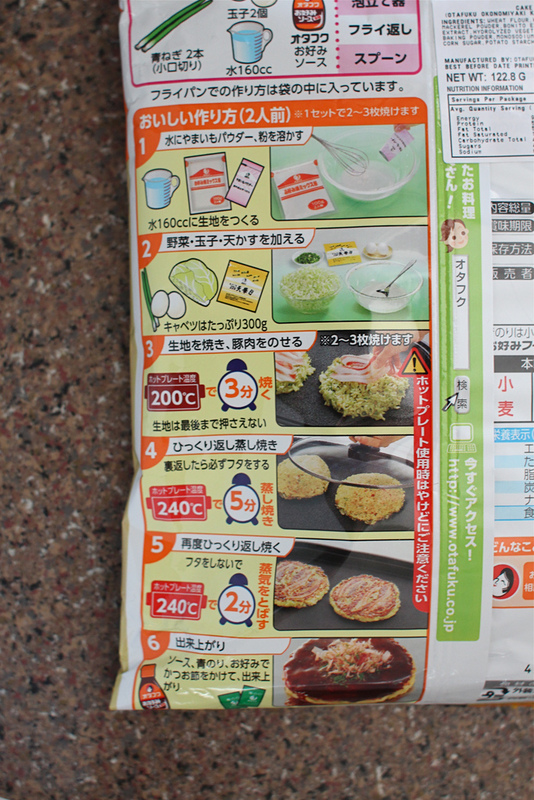 My interpretation of the packet instructions which were in Japanese and accompanied with pictures (note: I don’t know any Japanese). Plus I added in prawns and a mix of vegetables, and tried a pancake with yakisoba noodles. In a large bowl, whisk the flour, powder and water together until smooth. Add the vegetables, eggs and mix to coat with batter (don’t overmix as gluten forms and will make the pancake chewy). Add tenkasu and prawns, and mix through. Add some oil in a frying pan on medium heat. Add in half of the okonomiyaki batter mixture, flatten and shape to form a pancake. Add pork slices on top of the pancake. Cook for about 3 minutes, flip over and cook for 4 minutes (pork side down). Flip pancake over again (pork side up) and cook for another 3 minutes or until cooked through and well browned. Add a bit more oil throughout cooking process as necessary. *If using yakisoba noodles, add them in place of the pork. When the okonomiyaki has finished cooking, slide it onto a plate and top with okonomi sauce, kewpie mayonnaise, aonori and bonito flakes. Nice post Ai-ling. I'm with you on the okonomiyaki love. It astounds me that a food you grill yourself in Japan is done so shabbily locally. Having said that, Senoji in Vic Park does a decent one. Another Osakan dish they do in a similar vein is the squid pancake which is basically an eggy crisp-out, fluffy-in crepe dense with squid. Thanks Max :) I haven't been to Senoji yet, but will have to visit to try their okonomiyaki. 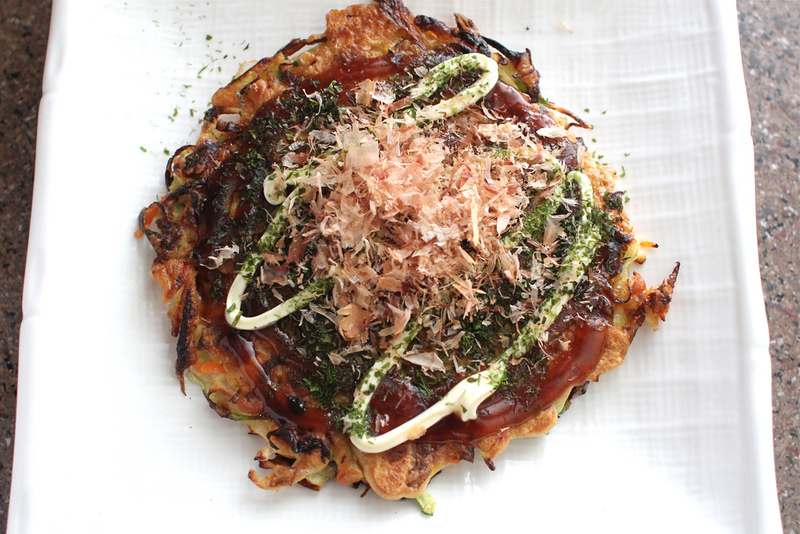 I wonder why more restaurants in Perth don't make okonomiyaki when it tastes so good, maybe it's hard to get it right as nagaimo isn't readily available. Was talking about making okonomiyaki over twitter yesterday with Moni and Conor, and Conor said she had trouble getting nagaimo so tried using xantham gum to get the goopiness. Moni said that most Japanese people use the packet mixes too. 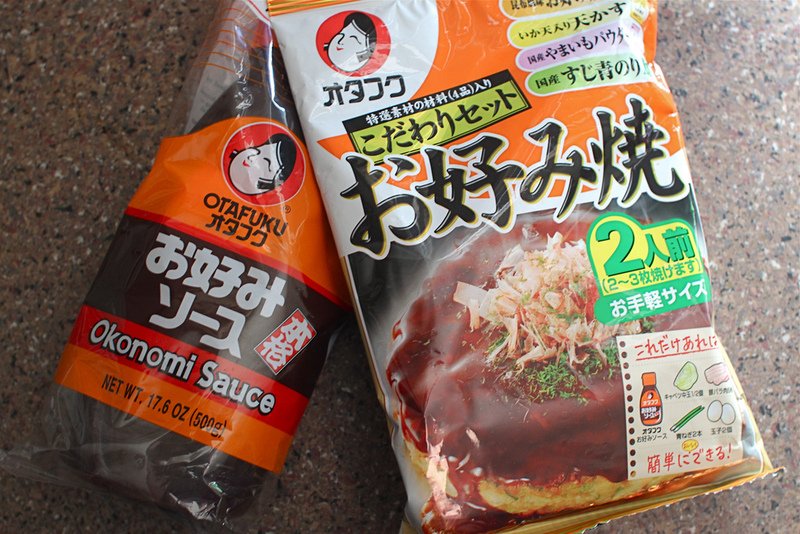 At the moment the packet mix will be my go to for my okonomiyaki fix! that looks like a pretty impressive looking Okonomiyaki you did at home. i would never have attempted to do one myself but i think with your recipe it should be much easier to try now. Looks great ! 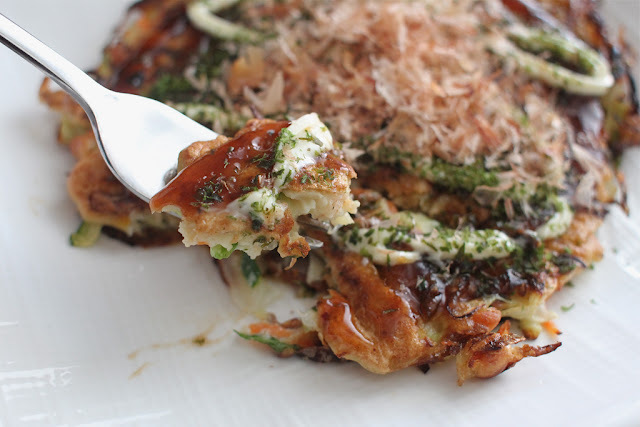 I remember searching out okonomiyaki when I was in Japan before - its definitely one of those 'must try' dishes! Thanks Christine :) I've heard that there are some places that serve good okonomiyaki in Sydney and I'm looking forward to trying some when I am in Sydney on 3 weeks. Hi Bec :) I wasn't happy with any recipes I found off the internet so I resorted to a packet mix with okonomiyaki flour which turned out great. Hope you can find some at your Asian supermarket. God, I luuuuuuurve okonomiyaki! Thanks for sharing the recipe. The dish that set off that defining moment for me and Japan was their ramen. Nothing beats slurping up a hot bowl of slippery ramen, standing shoulder to shoulder with stereotypical salarymen in Shinjuku. I love okonomiyaki to bits, but have never seen it here in Adelaide. 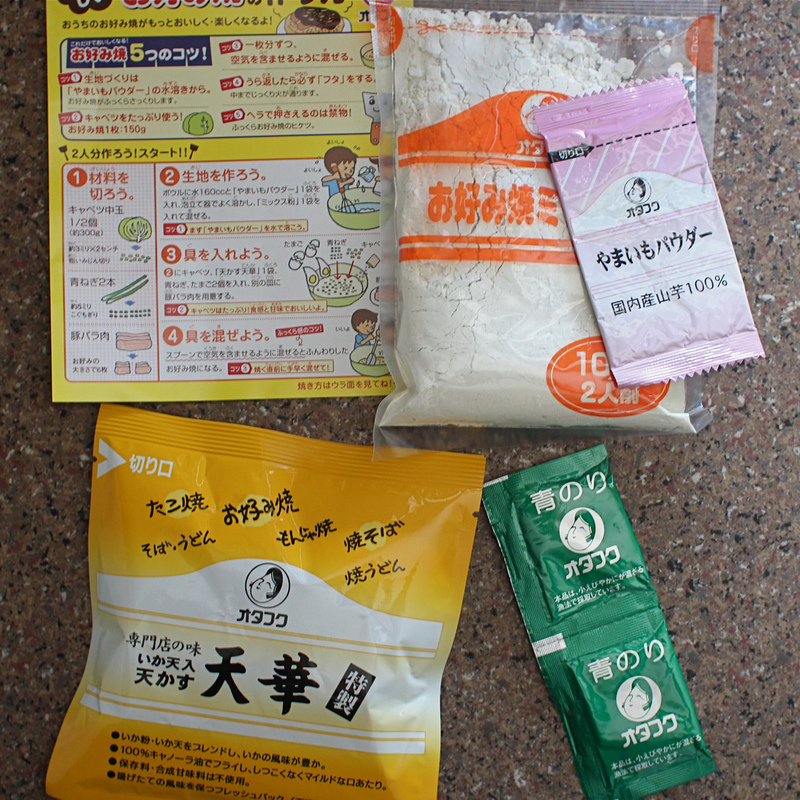 I have a packet of the mix (with Japanese instructions) so this post is perfect for me- thanks! Thanks Amanda :) Hope you enjoy the okonomiyaki mix! I'm definitely here with you on that. I just found another japanese stuff seling shop in Adelaide, Little Tokyo next to Victoria Sq and going to see if they have the proper flour mix as the central market asian didn't when I was there. I'm sure most of those who tried it love it. After trying it in Japan (home-made) while staying with Japanese people, I came back, bought the mix (takoyaki does just fine), bonito flakes, the sauce and mayo and now wonder why nobody sells it on the streets here in Australia. I'm sure it would be an instant hit, though probably not a cheap one like a burger.